Unveil the secrets behind two mysterious legends! 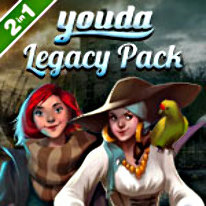 Expose the secrets of two mysterious legends with this exciting bundle of hidden object adventures! In Youda Mystery: The Stanwick Legacy, after inheriting your grandfather's mansion, young Emma discovers that there's more to this house than meets the eye! Help her uncover the secrets of Stanwick Manor.In Legacy Tales: Mercy of the Gallows, you must find out how William van der Decken, famous for his battles against pirates, and his lovely wife Isabelle vanished. What happened to her and why was the captain found dead, dressed as a pirate? Meet the ghost of a sad, young woman who needs your help and start this pirate adventure! - Go on a pirate adventure! - Discover the secrets of Stanwick Manor!